Last summer, our family enjoyed a stay at the enviable Obie Bowman house, also known as Living Roof. What I found most beautiful about The Sea Ranch — other than the unique, environmentally conscious architecture — is that nearly every view is dominated by five large fields of color: the pale brown untreated wood of the homes, the mustard grass, the deep green cypress groves, and the blues of sea and sky. Update: Owner Ken Sharples posted a comment with a link to rental information. More photos there and from my visit. 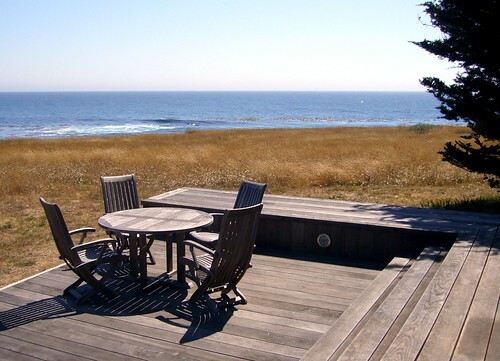 This place looks amazing and I would love to stay at a Sea Ranch home with such cool decor! The places I have stayed at there have been beautiful but have scary scary contemporary furniture. Can you direct me to the rental agency? Many thanks!!! I rent the house privately. You can see the advertisement and details here. I was just having a flashback of memories, being nine years old and learning to roller blade on the brick floors is a memory I will never forget. My uncle was the one that owned this lot and then hired Obie to build it. With the three trees throughout the house, and the bookcase over the front door with the sliding ladder. I was just wondering how much it costs to rent now a day?